In a perfect world learning to read would come naturally to every child. He or she would be diligent, persistent, and engaged during the entire process, eventually becoming a stellar reader (and perhaps writer, too. )But real life doesn’t typically mimic fantasy. For many youngsters, learning to read can become a difficult, frustrating experience. Whether they simply have trouble making connections, memorising letters, or focusing on the task, they wind up forming a negative association with becoming literate. As a parent, educator, babysitter, grandparent or guardian, it’s up to you to encourage and assist your child through the sometimes turbulent waters of learning to read. And even if reading seems “easy” for your youngster, it’s still critical for you to take an active role in his or her development. Here, we’ll explore a few of the best ways you can help your child on the road to literacy. It’s hard enough for some children to figure out how to read – what they absolutely do not need is someone making them feel defeated or “bad” about their stumbling blocks. Even if you’re extremely frustrated by your child’s lack of progress when it comes to reading, do not show him or her anything but optimism and support. However, you can be firm and insist that he or she spend five minutes a day on letters – just don’t yell or punish. Becoming angry with him or her may wind up causing him or her to want to read less and less. One of the best ways to make reading a wonderful, magical, intimate experience is to take time out of your busy schedule every day to Read to (or with) Your Child. Choose a time when distractions are at a minimum, such as post-dinner or before bedtime. 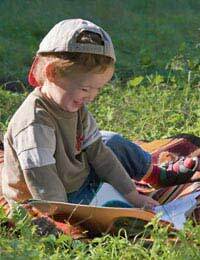 Make this a special bonding experience for both you and your special youngster and he or she will be more likely to think of reading as a warm, lovely event. Children imitate the adults in their lives, whether those grown-ups are their mums, dads, or teachers. Therefore, if you want your youngster to read, you’ll have to read yourself. Even if you only read the newspaper in the morning, be sure to explain to your child how interesting it is to be able to find out about the world around you. That way, he or she will see the act as natural. Children who are just learning to read need to have opportunities to showcase their newfound abilities; therefore, why not ask your son, daughter, or student to read to you? Even if your little one is only “making up” the story or reading very simple words, that’s perfectly fine. The aim of this exercise isn’t for him or her to be perfect – it’s to build his or her confidence. Not a literal library in terms of brick-and-mortar buildings, of course, but a library of books that are his or her own. Having one’s own personal collection of books (even if it’s just a few) can make a child who is learning to read feel incredibly special. Ask him or her to pick out favourites and work on reading them together; you’ll be amazed at the progress that can be made when you take an interest in your child’s reading development.